"The report says the biggest costs, nearly $8.5 billion, or 70 percent, are those associated with re-issuing all 245 million American drivers licenses so that they comply with the new standards." OTTAWA, Ontario, June 1, 2005 (PRIMEZONE) -- BlueBear Network International, Inc (Pink Sheets:BLBR) announced today it has extended its exclusive licensing of facial recognition and secure distributed search technology from Ottawa-based VisionSphere Technologies, to offer State motor vehicle agencies the ability to link driver's license databases between all U.S. states, Canada and Mexico -- as proposed by the sweeping REAL ID Act approved by Congress this month. "The passing of the Real ID Act by Congress earlier this month will enable BlueBear to position itself to be a key technology player in linking driver's license databases throughout North America," said Andrew Brewin, President and CEO of BlueBear Network. "Given that BlueBear is already deploying information sharing systems in Law Enforcement, adding Driver's Licenses is a logical extension." BlueBear, as the exclusive licensee, adapts that technology for law enforcement by building applications for forensic identification, background checks and the fight against child exploitation. BlueBear Network International, Inc. (Pink Sheets:BLBR) is a Nevada registered company based in Ottawa, Ontario, Canada. An educated guess would be that the ultimate goal is to have the Real ID number assigned at birth. It will be a lifetime number to identify a person. Support for that conclusion is that a cradle-to-grave integrated school-workforce development system is being installed in the schools. And students are being conditioned to accept RFID cards. 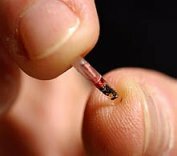 The ultimate goal of course would be to have RFID chips with the REAL ID number on the chip embedded in the skin at birth. First the 'Smart ID' with the RFID chips, then the Verichip - one step at a time towards totalitarian control. EVERYBODY will have to have newly issued government ID - "Real ID". Pg. 5 "The United States Real I.D. Act mandates that beginning in May 2008, a state driver license or ID card cannot be used for any federal purpose (including boarding an airplane) unless it meets specific federal requirements." Pg. 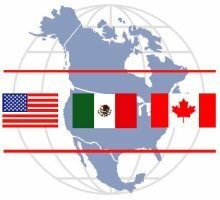 10 "As a first step, a bi-national working group should be established to identify and develop proposals for alternative forms of "secure documentation", such as a new, more secure driver license or other forms of documentation that would comply with the requirements of the U.S. Real ID Act of 2005. Today a driver license, whether issued by a department of motor vehicles in a Province of Canada or a U.S. State is the most common form of identity document. 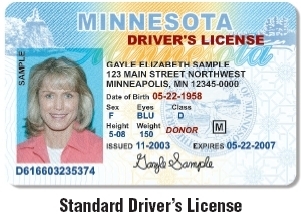 With a photo signature and physical description, the driver license assumes a role beyond its original purpose of identifying a licensed driver and is frequently used for personal identification when crossing the border. "This bill establishes a massive, centrally-coordinated database of highly personal information about American citizens: at a minimum their name, date of birth, place of residence, Social Security number, and physical and possibly other characteristics. What is even more disturbing is that, by mandating that states participate in the “Drivers License Agreement,” this bill creates a massive database of sensitive information on American citizens that will be shared with Canada and Mexico! ...This legislation gives authority to the Secretary of Homeland Security to expand required information on driver’s licenses, potentially including such biometric information as retina scans, finger prints, DNA information, and even Radio Frequency Identification (RFID) radio tracking technology. Including such technology as RFID would mean that the federal government, as well as the governments of Canada and Mexico, would know where Americans are at all time of the day and night." Washington State - Enhanced Dual Purpose Driver's License - Border Crossing Card (with RFID chip). The federal REAL ID Act (P.L.109­13) was a sneaky way to set up a Big Brother NATIONAL ID system. Thus far in 2007, 24 states have introduced legislation to refuse compliance with REAL ID (the federalization of driver's licenses, and other types of ID cards, as well as the linking of all state motor vehicle databases). To date, legislation rejecting REAL ID has been enacted in Maine, Idaho, and Utah; legislation is "pending" in the other states. Also see attached pdf of all state legislation regarding IDs (as of 3/14/07). REAL ID incorporates the technologies that will allow government to track and monitor holders of REAL ID compliant identification cards. In addition to the problems of privacy invasion and increased identity theft risks, federal control over ID standards -- which tramples state rights -- eases the path to creating a North American ID card and database for citizens of the developing North American Union. Correct me if I'm wrong, but it appears that the congressional proposals are a case where the cure is worse than the disease. Instead of just repealing the REAL ID Act, it is also proposed to insert (national) ID standards setting from another similar law! The proposed bills also increase federal funding -- which will expedite state implementation of a national ID system. The REAL ID ACT isn't the only problem: the "Intelligence Reform and Terrorism Prevention Act of 2004 (section 7212)" falls in the same category. Why are there TWO Congressionally approved bills about "driver's license and personal identification card" standards? Why would language from one law (section 7212 of the Intelligence Reform and Terrorism Prevention Act of 2004) be proposed to replace the language in the other law (REAL ID)? There are disturbing historical accounts of abuses connected to governments collecting and storing data on citizens. A paper titled "Government Statistics and Individual Safety: Revisiting the Historical Record of Disclosure, Harm, and Risk" contains eye-opening information on incidents. HR 1117 was introduced by Maine Rep. Thomas Allen on Feb. 16, 2007 -- "To repeal title II of the REAL ID Act of 2005, to reinstitute section 7212 of the Intelligence Reform and Terrorism Prevention Act of 2004, which provides States additional regulatory flexibility and funding authorization to more rapidly produce tamper-and counterfeit-resistant driver's licenses and to protect privacy and civil liberties by providing interested stakeholders on a negotiated rulemaking with guidance to achieve improved 21st century licenses to improve national security." S.717 was introduced 2/28/07 by Hawaii Senator Daniel Akaka -- "A bill to repeal title II of the REAL ID Act of 2005, to restore section 7212 of the Intelligence Reform and Terrorism Prevention Act of 2004, which provides States additional regulatory flexibility and funding authorization to more rapidly produce tamper- and counterfeit-resistant driver's licenses, and to protect privacy and civil liberties by providing interested stakeholders on a negotiated rulemaking with guidance to achieve improved 21st century licenses to improve national security."